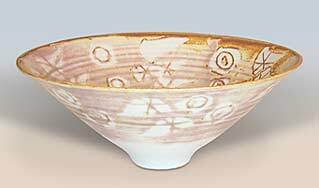 Marianne de Trey bowl - 8" (203 mm) diameter, 3½" (88 mm) high. Marianne de Trey was born in London in 1913 of Swiss parents. She studied textile design at the Royal College of Art. She married Sam Haile in 1938 and moved with him to the USA where he taught her to pot. The couple returned to England in 1944. After the war they worked together at Bulmers Brickyard in Sudbury, Suffolk at the pottery built by Mary Gibson-Horrocks. In 1947 they took over Shinner's Bridge Pottery in Dartington, Devon, but a year later Sam was killed in a road accident. Marianne carried on at Shinner's Bridge alone, and was later host to the Dartington Pottery Training Workshop. She moved to smaller premises in 1985.